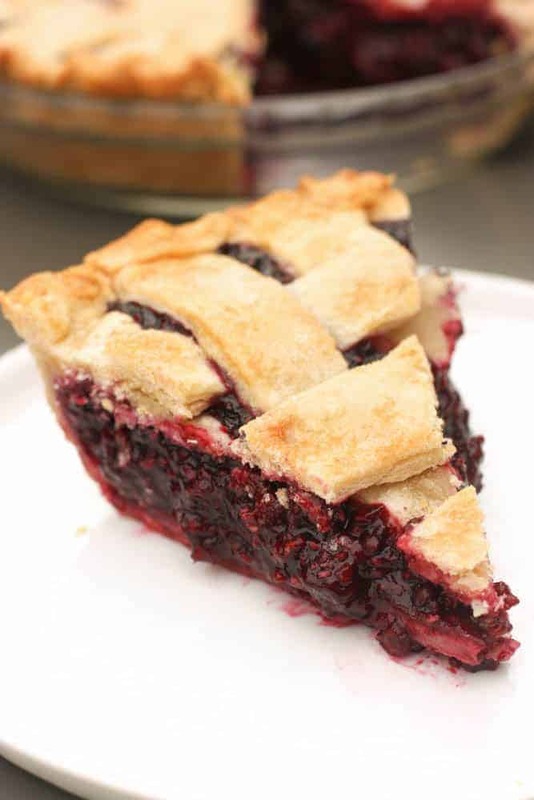 You just can’t beat this simple and delicious homemade Triple Berry Pie! It holds together perfectly every single time, and you can use fresh or frozen blueberries, raspberries and blackberries. If you’ve tried any of my other favorite pie recipes, you may have learned that I’m a Pie FREAK. It’s my NUMER ONE at Thanksgiving. 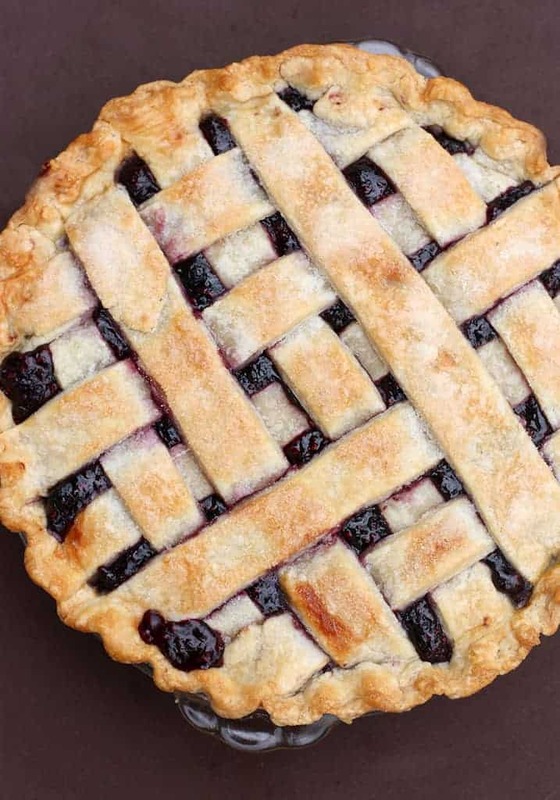 My Mom mastered this Triple Berry Pie years ago. It’s always the first gone at Thanksgiving–even for my husband who usually detests berries with seeds in them. This pie is restaurant quality! Scratch that. It’s BETTER than restaurant quality, because it’s made from scratch! The crust is my Grandma’s “Prize Winning” pie crust recipe, which couldn’t be easier to make. 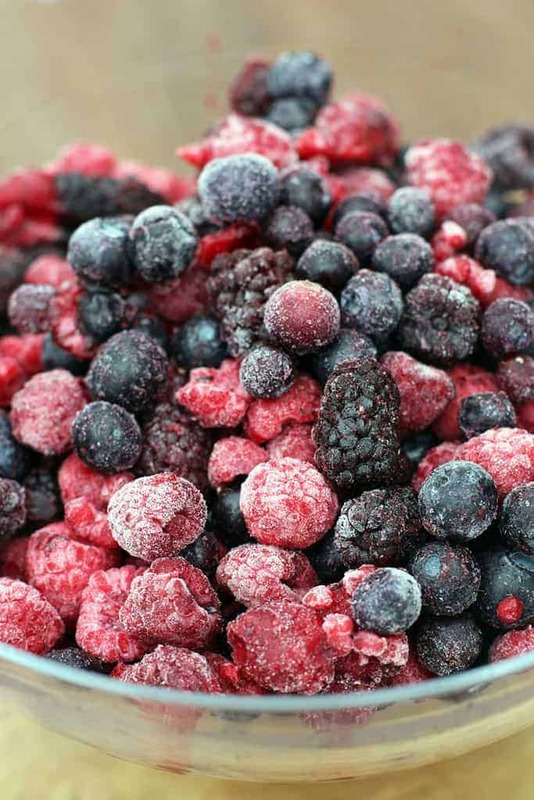 For the filling, I use these big beautiful frozen berries you see below. They’re the 3-berry pack in the frozen section and the price is unbeatable. They are the biggest, nicest frozen berries I’ve ever seen. Don’t you just love costco?! Cook the berries down with a little bit of sugar, lemon juice, and a cornstarch slurry. Then pour the hot filling into your unbaked pie shell. Confession: I’m the absolute worst at doing a “lattice” crust on a pie. In the first picture above you would notice my mistakes if you looked closely enough. I tried hard on this one, but next time I’ll just do it my mom’s way. She cuts the top crust into long thin strips for a lattice crust, but then she simply lays 4-5 along the top of the pie, leaving a small space in between, and then 4-5 strips on top of those, going the opposite direction. It still looks beautiful, and then you don’t have to overthink the whole “over/under” pattern. It has way less sugar than most berry pies. It’s still amazingly sweet, but it’s not overly sweet, like some berry pies tend to be. It has the perfect amount of liquid to yield a pie slice that holds its shape. Some berry pies are so juicy that they completely fall apart when you cut into them. This one will turn out beautifully, as long as you let it cool for several hours before cutting into it. So there you have it. Our family’s favorite Triple Berry Pie. Perfect for Thanksgiving or Christmas or any time you’re craving some pie…which, for me, is ALWAYS. You can freeze the baked pie for up to 3 months. Thaw overnight in the refrigerator and allow to come to room temperature before serving. The prepared filling can also be frozen up to 3 months, thaw overnight in the refrigerator before using. This triple berry pie always gets raving reviews! It holds together perfectly, every time and you can make it any time of year, with fresh of frozen berries. Add berries, sugar and lemon juice to a large saucepan over medium heat. Spoon out about 1/2 cup of the juice from the pan into a bowl. Stir cornstarch into the juice until smooth. 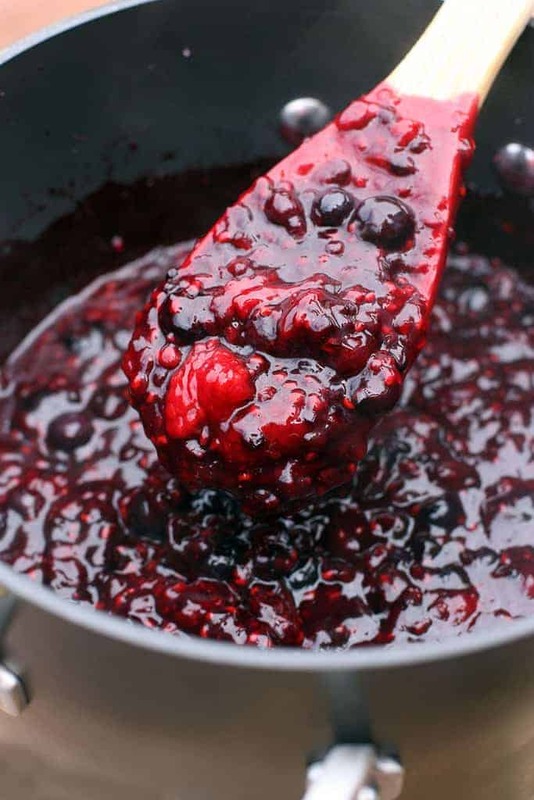 Bring pot of berries back to a simmer and slowly pour in the cornstarch. Gently stir mixture (being careful not to mash the berries), until thickened, about 2-5 minutes. Remove from heat and stir in the butter. Pour mixture into unbaked pie shell (in a 9 in deep dish pan). Add lattice top or a whole top with holes pricked on top for steam to escape. Pinch the edges of the top and bottom pie crusts together and crimp the edge, if you like. Brush a thin layer of beaten egg white over the top of the pie and sprinkle lightly with sugar. Remove to a wire cooling rack and allow to cool for several hours. Once cooled completely, you can cut into it or cover it and refrigerate it overnight to serve the next day. *I LOVE Costco's bag of frozen berries. It already has all three types of berries and they are big and beautiful and you can't beat the price! 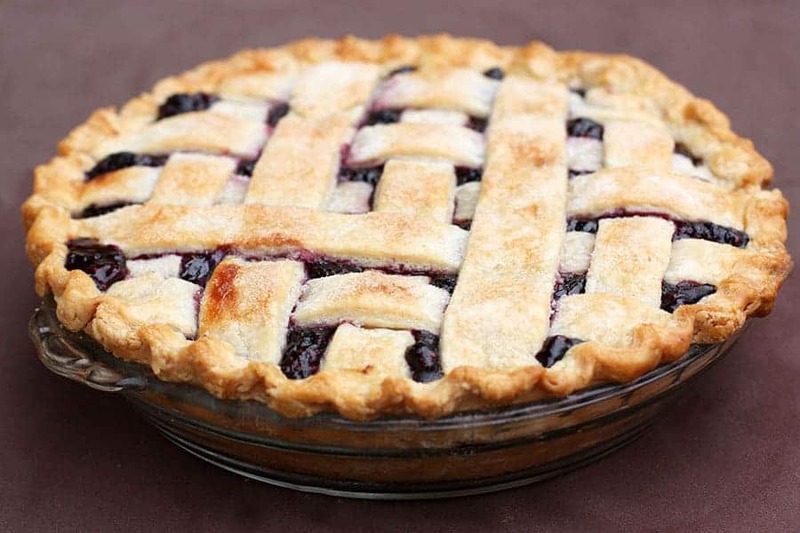 Tips for perfect triple berry pie and for making ahead of time are listed in the post above! This recipe is outstanding! My family was hesitant at first when I made this for Thanksgiving. But once they got a taste, they tore through it in no time. I loved it. Simple, not too sweet. Just perfect. We all love the triple berry pie! It is a huge hit at my house! The instructions are very good and easy to follow. I have not considered myself a pie maker until I tried this and it actually turned out!!!….perfectly!?. Thanks so much for sharing your passion and talent Laurén!! 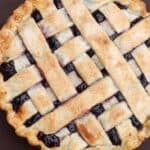 What size of pie tin should I use? Hi Sam. I use a 9 inch deep dish pie tin. Any pie dish will work. If you use a smaller one you may just have a little extra filling. I’ve made this pie several times and it always comes out perfectly. I double the recipe and make it in a 9×13 pan for large gatherings. I’ve made this twice now and it has become a family favorite! Didn’t change a thing and wouldn’t — perfect as is! I’e adapted the recipe for other fruits and now I know how to make a great pie filling using frozen fruit! Thanks for such a foolproof recipe! Hey is it In cups and not grams or Ounces i mean it is easier to messy berries in weight in stead of how much it is filling for a fluid measurement instrument (or powder)? This was my first attempt at a triple berry pie . . . it came out perfectly! I didn’t change a thing and I’ve printed out the recipe for my “Family Cookbook”! Marvelous pie!!! I had never had, nor made a berry pie until it was requested by my niece for her birthday. It is now a family favorite. I made another one for my brother’s birthday–it was gone in one sitting. Thanks so much for a wonderful recipe. Hello! Do I not need to prebake the pie shell? No, the pie crusts are unbaked when you add the filling. Amazing I tried it one wand was hooked. I fort made it for pi day on March 14 and I made the crust little pi symbols. It was AMAZING.